I’ve written about rubber-banding before over on Post-Play’em where I talked about my observations of how it is used in Mario Kart: Double Dash. Rubber-banding is hardly new. It is often a subtle mechanism designed to keep games interesting and competitive. It is especially prevalent in racing games. For those that aren’t familiar, the concept is simple. If you are doing well, the competition starts doing well. If you are sucking badly, so do they. That way, you always have a race on your hands—regardless of whether you’re in first, the middle of the pack, or in back. Sometimes, it can be more apparent than others. If competitors are teleporting to keep up, that’s a bit egregious. If you come to a dead stop in last place, and so do the other racers, that’s way too obvious. The interesting thing is that sometimes, it can be more than just about fairness and a running a good race. Sometimes it can be used because it is inherently tied to a design mechanic other than racing. I saw this review on Thunderbolt of the new game Split/Second where it explains this phenomenon. The game is, on the surface, a racing game. However, in a mechanism borrowed from the aforementioned Mario Kart, the gameplay heavily revolves around “power plays“. These involve triggering things like exploding cars alongside the road, crumbling buildings, and helicopters dispensing explosives. You can even trigger massive changes for your foes like changing the route entirely. Needless to say, that has the effect of annoying the piss outta your opponents. The problem comes when those opponents are not human ones, but AI. Split/Secondisn’t too difficult until some of the latter stages of the career, but unfair AI is a common problem throughout. It’s testament to the game’s focus on power plays that this unfair AI often occurs, since being in the lead isn’t a particularly fun experience when you can’t trigger the game’s main selling point. As a result, you’ll often find the following pack extremely close behind, often catching up six second gaps within two. Even when you know your car is much faster and you’re driving the race of your life, the AI finds a way to pass you with relative ease, performing impossibly good drifts and respawning from wrecks in the blink of an eye. Dropping from first place to fifth is such a common occurrence it would actually be quite comical if it weren’t for the frustration involved. That’s not to say Split/Second is a hard game – it’s usually pretty easy to wreck opponents with a decent power play, and you’ll normally be given ample opportunities to pass them – but the rubber band AI does cause some unwieldy races where the AI will pull ahead rather than keeping at a more realistic, surmountable distance. As you can see above (emphasis mine), the rubber-banding is about more than keeping the pack close behind you if you are doing well. In order for the power plays to be relevant, you can’t be in the lead. You need to be behind them to use them. This is analogous to the “blue shell” in Mario Kart that would streak from wherever you were all the way up to the front of the pack and tumble the first-place kart. 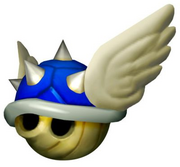 You simply can’t use the blue shell if you are in first place. In fact, the game won’t give you one if you are in first. In Split/Second, the whole point of the game is blowing crap up and screwing with the other drivers. In fact, most of the fun of that is actually seeing it happen. While, in Mario Kart, you can use red or green shells, bananas, and fake blocks to mess with people behind you (and this is a perfectly normal tactic), the result of that isn’t the visually stunning and exciting experience that the power play in Split/Second is. Therefore, the designers of Split/Second had to make sure that you were able to use the power plays and see them in action. In Split/Second the entire point of the rubber-banding is to make sure you aren’t in first—at least not for very long. The difference between these two approaches is subtle. The rubber-banding in Mario Kart makes sure that, if you are in first, you can’t make a mistake without having people pass you. In Split/Second the entire point of the rubber-banding is to make sure you aren’t in first—at least not for very long. You have to wonder how this mechanism would translate over to a shooter game, however. If rubber-banding in a shooter is to make sure you are challenged to a good fight… but one that in which you eventually triumph, a change to one where the AI is supposed to ensure that you don’t triumph would be a bit awkward. In fact, that would be negating the game’s purpose of having you see the rest of the content down the road (so to speak). AI in shooters is really cut from the same template of the rubber-banding in Mario Kart then. “Do well, and then lose.” It was just interesting to see a different take on this mechanism that generates a different outcome for the perfectly viable reason of making the game better. I happened across this blog review of the game “Days of Ruin” for Nintendo DS the other day. I noticed it because my Google alert for “GAME AI” picked up the following sentence. The game’s AI is sneaky and -well- intelligent too. It responds to the type of units you create and your strategy. If you make an army of wartanks, it’ll create an army of anti-tanks to counter your offense. If you make bombers to get rid of his anti-tanks, it’ll create fighters to take down your bombers. If you happen to have an artillery bombardment as a defensive strategy, it will try to keep its ground units away from your range and will cautiously try to take it down when you drop your guard. While the game is fun, it also comes with a bit of frustration. In addition to a really smart AI, your computer opponent also has an unfair advantage of extra units, money, and bigger guns. Making the game, in some chapters, nigh unbeatable until you find the perfect strategy. I swear I was stuck in 2, probably 3, chapters for weeks. And without an option to change the difficulty of the game, I almost gave up on it after a lot of my strategies have failed. This is the price you pay for that simplicity. While it is easy to do the reaction-based AI that was alluded to at first, it is a little more important to be able to tweak it to not be a challenge all the time. NFL Tour AI comes up a yard short? I haven’t gone out of my way to look for reviews on NFL Tour. This one, however, popped the alarm on my Google Alerts. Unfortunately, the gameplay is just way too simple. The game is so simple to play that a monkey could easily score a touchdown on the lacking AI defense of the computer. If you want to win games in NFL Tour, just snap the ball and pass to anyone. Don’t worry… unless you are terrible, there is no such thing as an incompletion. I put in about 6 hours of gameplay and my QB accuracy is 100%. I guess that really shows that it takes a team like the Madden/EA crowd 10… 20… 30 years of working on a franchise before they can get AI to what it needs to be (almost?). Sports AI will always be a challenge… and this title looks like they are trying to prove it. I don’t do game reviews… but I think the consensus speaks loads. Soccer game with adaptive AI? According to reviews of “Pro Evolution Soccer 2008” from Konami, there is now an adaptive AI component. This system, called “TeamVision”, aparently learns the way you play. If you always use the same tactics, it will start taking advantage of them – both on offense and defense. Every review site I have looked at has a similar blurb to that effect, but I have yet to see any technical description of how they are accomplishing it. More research is necessary! If you have run across information on this game and specifically the “TeamVision” adaptive AI system from Konami, please let me know so I can follow up.